Longest Running Cozy in the World: Agatha Christie’s Mousetrap has been running uninterruptedly in London since November 25, 1952. 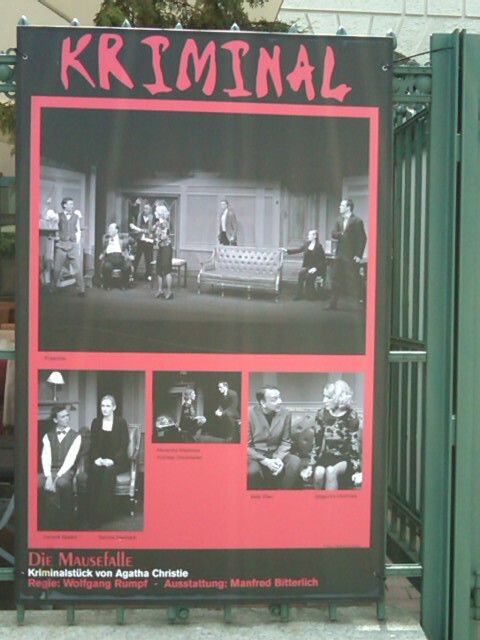 Last night I saw it here in the Kriminaltheater in Berlin. 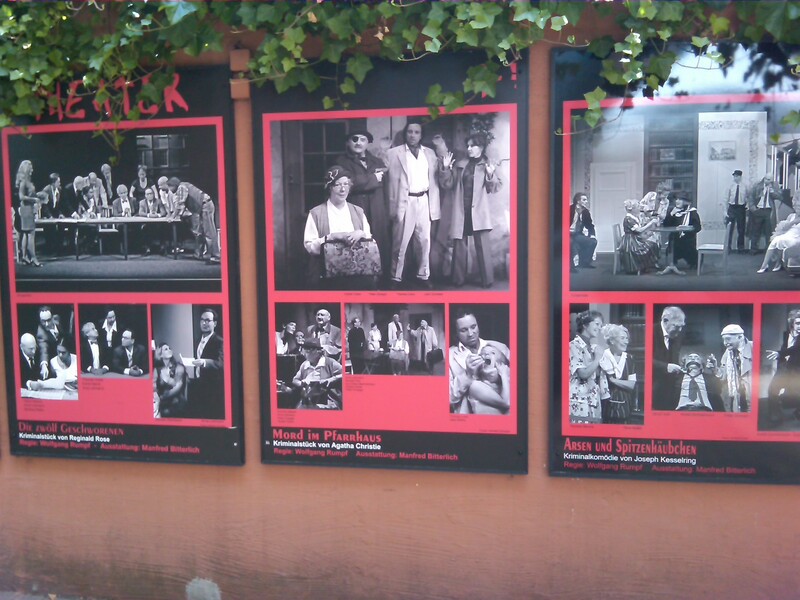 This theater, with its repertoire of murder mystery plays, from Arsenic and Old Lace to The Hound of the Baskervilles, sits in the heart of old East Berlin, Friedrichshain, right off the Karl-Marx-Allee, now an up-and-coming Bohemian center of the new Berlin. And what is this theater’s biggest hit? Die Mausefalle—The Mousetrap, a quintessentially English murder mystery, set in a chilly guesthouse, Monkswell Manor, outside London, shortly after the second world war. On the repertoire of the Berlin Kriminaltheater since January 2001, it has already had 150,000 visitors, and soon, on June 17, it will have its thousandth performance. How does one explain the success of this play? The performance I saw last night, in the German translation of Horst Willems, struck me from its first moments on as authentically British, at all events, the kind of “British” that one thinks one remembers from childhood. I am a native Briton who “remembers” the days of post-war austerity, and when I came out of this German theater, and took the U5 subway back to the Alexanderplatz, I “heard” the dialogue in my head as having been English—very English, I would say, as a Welshwoman. I seemed to hear the dulcet tones of BBC English coming out of the big old wireless in the corner of the hotel lounge where the play is launched by the news-reader reporting the murder of a woman in Paddington. And then the middle- to upper-class English spoken by the eight characters who gradually assemble onstage: the young couple who have just opened the guest house, the guests who arrive in a snow storm, one by one, and the police inspector who skis in last and sets about interrogating them. Very English, it all seemed to me, German as it was, and very true to the times, all the characters as they arrive rushing into the room and making straight for the open fire to warm their hands in front of the flames, and then throughout the play competing unashamedly for the one comfortable chair that stands in front of the fire. Only the song, Three Blind Mice, sung and whistled at intervals in the play, with sinister effect, did not come off as well in German, because the threatening monosyllabic three beats of Three Blind Mice are diluted by the extra syllable that has to be put into the German Drei kleine Mäuse. And does the German audience really feel, as I did, the accumulative horror of the well-known children’s rhyme to which we little girls used to skip in the post-war streets? Three blind mice/ Three blind mice/ See how they run/ See how they run/ They all run after the farmer’s wife/ Who cut off their tails with a carving knife/Did you ever see such a thing in your life/As three blind mice/Three blind mice. It never struck us children as being horrific, but here a note left on the first offstage murder victim claimed that there were “three blind mice” to be murdered; it is gradually made clear that the murderer and the two potential next victims are here onstage before our eyes, and so gradually the creepiness of the song steals over us. But why is this play such a huge and lasting success, in cities as different as London and Berlin? It is—what?—just an ordinary, one might say, routine murder mystery, with the usual unlikely coincidences that one takes for granted. A group of characters marooned in a country house, a detective with reasons to suspect them all, twists and turns of the dialogue that make first one then another seem guilty, characters turning on each other and exposing pieces of their past in their responses to the increasingly tense interrogations, one more murder, a reconstruction of this crime, and then finally the exposure of the murderer, which still, I believe, comes as a surprise, despite the years during which this murderer has been exposed on the stages of the world. It is a tradition at the end that one actor steps forward during the curtain calls and asks the audience to keep it a secret. And in our modern world where no secrets may be hidden, I can still be shocked that Wikipedia actually reveals the ending. (I urge all readers of the blog to resist turning straight to Wikipedia). Amazing, is it not, that of a play with one brutal murder offstage and another onstage, we are still inclined to say, it is not violent? True, it is not the violence in the play that engages the mind or provides the fun, it is the process of detection. This does not incite the cruel part of our imagination. We can feel excitement in the challenge of guessing who committed the murder, and yet safe in the inexorable steps towards justice. But is all this in fact a trivialization of the horrors of murder? Be that as it may, here in the heart of old East Berlin, th e actors of the Kriminaltheater will soon be engaging the mind and providing the fun of the Mausefalle for the thousandth time. Perhaps I will go again. 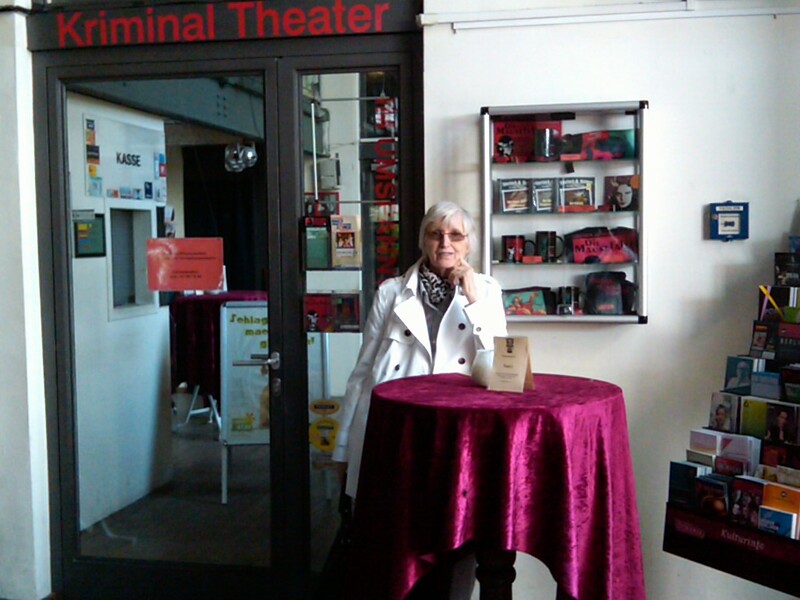 This entry was posted in Berlin theater, cozy mystery, detective fiction, mystery play and tagged Agatha Christie, Berliner Kriminaltheater. Bookmark the permalink. I saw Mousetrap in London back in the late 80s and it was excellent. Mystery fiction is a great genre and, for what it is worth, I have always found the fun of reading or seeing a mystery is in the detection. It is a fictional character being killed off for the pleasure of detecting, and the kinds of murders that happen in books rarely happen in real life, making them safer and easier to accept. But I find it frustrating when a mystery writer doesn’t a least allude to all the clues available to the detective, so the reader can try their hand at solving the crime. On the other hand, I don’t like it if I can guess who did the crime halfway through the story. Detective fiction really requires a delicate balance on the part of the author in that way, and that is what makes good detective fiction for me. I started detecting as a kid playing Clue, and reading Nancy Drew and it just continued from there. Definitely agree, Alex, the reader should be given a fair chance to solve the crime, otherwise one feels cheated. But it’s a tricky business, giving enough clues but subtly so that everything is not too obvious. I think Agatha Christie pulls it off in the Mousetrap. I also saw it years ago in London, and the murderer was quite a shock then. A delicate balance it is, as you say. Though I must say, in my own murder mysteries, I do not know the murderer myself until close to the end. Probably not the easiest way to write a mystery, but I can’t do it any other way.